Elbrus covered with snow and ice, determines the climate and weather of a considerable area. “Elbrus is the biggest skiing mountain in the world” is the opinion of mountain skiers. Elbrus slopes has favorable conditions for skiing and modern snowboarding all the year round. It is a perspective place of International competitions. 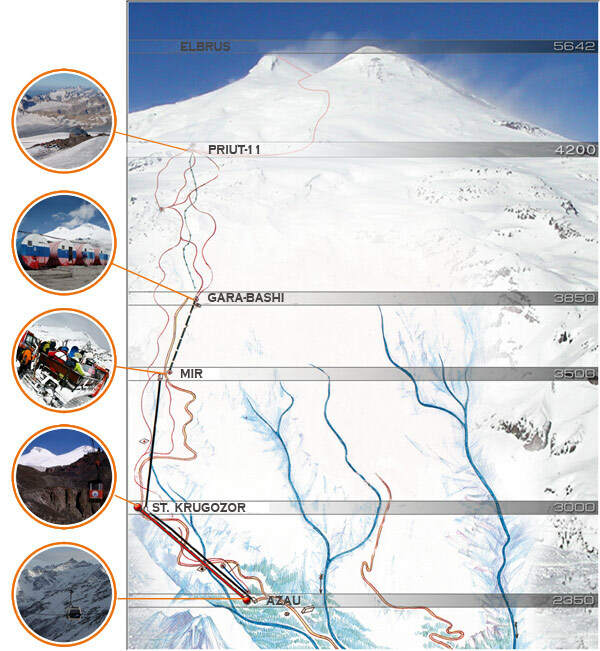 High to Elbrus are going the aerial ropeways. Its maximum point – 5642 meters. The lifting height by cable-ways – 3850 meters. Then skiers use the services of snow-tractors to ascent till Pastuhov rocks – 4800 meters. New gondola cable-way ”Krugozor-Mir”. Finished! Mt. Elbrus represents two summits of the extinct volcano – the Eastern by an altitude of 5621 m. above sea level, the Western-5642 m. above sea level. The main composition of the rocks – gneiss, granite, diabase tuffs and volcanic origin. It is located on the Bokovoy Ridge and joins the Main Caucasian Ridge by Hotutau Pass. The main part of the slopes are flat. 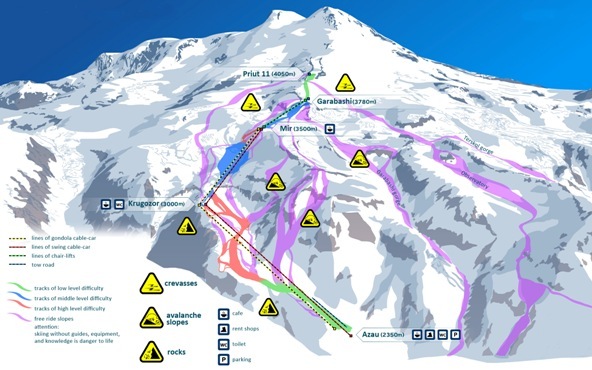 The whole length of ski-tracks is more than 15 km. The longest one is “Stary Krugozor – Azau” – 2500 m. All ski tracks have a marking and serviced by snow tractors – special high mountain catterpillar tractor. Its possible skiing to high slopes of Elbrus with elevating by the snow-tractor. The surface of the height of 3500 m is mostly covered by glaciers (of 77), whose area 144.5 sq.km. On the free surface of the glaciers – moraines. Most of the slopes – are flat, but the height of 4000 m average slope reaches – 35 degrees. On the western and northern slopes there are steep rocky sections to a height of 700 m. The glaciers are cut up with the cracks and in the bottom they end with the icefalls. There are a lot of cracks, vertical rocky-ice segments, and icefalls on the northern and western slopes. Below 3500 m rock stone debris and often in the summer, covered with melting snow fields.